Shrubs add color, texture and balance to the landscape. Flowering deciduous shrubs offer fluidity in the landscape with renewed growth in the spring, foliage and flowers in the summer and dormancy in the winter. Evergreen shrubs offer an air of permanence and continuity in the landscape. Like trees, shrubs in the Denver area need to be pruned to improve health and appearance. Pruning shrubs periodically keeps them full of foliage and flowers. Donovan Arborists prefers to prune most shrubs by hand. In doing so, any dead and diseased stems are removed and proper pruning cuts are made in shaping the shrub to its natural form. When the customer prefers a more formal appearance to their shrubs or hedge, our arborists are experts in shearing. Shearing shrubs produces a think plant for borders and screens. A hedge that is sheared, will need to be thinned periodically to maintain health and vigor. Natural Prune – The shrub is pruned to remove any visible dead. The foliage is thinned and the shrub is reduced and/or shaped as appropriate. 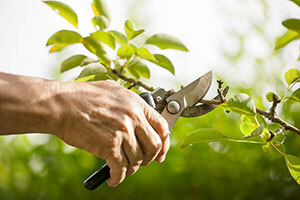 This pruning is done with hand tools such as hand pruners, loppers and hand saws. Renewal Thin – This is similar to a natural prune but the shrub is thinned by removing select older canes to allow light penetration and regenerate growth. Our goal with this pruning is to promote foliage on the lower half of the plant. Rejuvenation – The shrub is cut to low stump during winter or early spring. This is appropriate for shrubs that have over grown their space or that have been damaged. Shear – The shrub is sheared into either a hedge or rounded shape for a more formal appearance. We may recommend a combination of shearing with thinning to allow light to penetrate the plant.